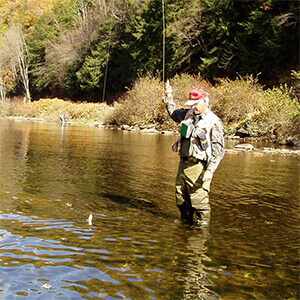 Clean water, pure air, and an ecosystem found nowhere else make, Clearfield County one of the best places to fish in the country. Grab your bait and head for Clearfield County’s Backwaters, you just may wrestle in that Big One the locals have been bragging about! Clearfield County has miles of largely navigable streams and lakes; you can drop your anchor and patiently wait, put on the waders and get some quality fly fishing in, or simply have a seat at streamside and plop a baby night-crawler into the water. Something’s always jumping somewhere! Enjoy fishing the 20-acre Parker Lake in Parker Dam State Park. Electric powered and non-powered boats are permitted and you can enjoy fishing year round at the park. Several times a year the Pennsylvania Fish and Boat Commission stocks Parker and Little Clearfield lakes with brook trout. Parker is also home to largemouth bass. 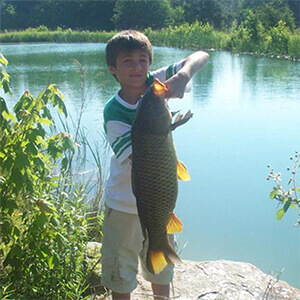 Anglers can also catch sunfish and brown bullhead. With 102 miles of the 228 mile West Branch of the Susquehanna River meandering through the county, so grab your gear and set out for a fishing hole on the West Branch of the Susquehanna River! Clearfield County has no shortage of fish inhabited water. In fact, we have the only section of the West Branch of the Susquehanna River that is stocked by the state Fish and Boat Commission. Trout, catfish, bass, muskie and walleye are waiting to be caught. Resident and non-resident licenses are available at Jim’s Sports Center, Bob’s Army & Navy and other locations throughout the county. Kids will enjoy dropping their line off of several bridges along the West Brank of the Susquehanna River. Hog Back Bridge, RT 879, is located between Curwensville and Clearfield or you can travel further down the river and stop at the Hyde Bridge, Market Street Bridge or the Nichols Street Bridge. Kids also enjoy fishing along the river banks alongside the bridges. Another great spot for kids to fish the West Branch of the Susquehanna River is at Lower Witmer Park and by the Shaw Public Library. You will want to be sure to check the hot fishing spot at Clearfield’s Raftsman’s Dam. If your preference for fishing includes finding spots no one else knows of, Quehanna Wild Area is speckled with streams that are as scenic as they are plentiful. Native brook trout are especially fun to catch and release. Solitude is promised - you can fish all day and never see another human being. You can find solitude in Moshannon State Forest at Shargger’s Inn. Shagger’s Inn is a warm water fishery which offers a variety of species. Resident and non-resident licenses are available at Jim’s Sports Center, Bob’s Army & Navy, Belding & Mull Philipsburg and Walmart in Clearfield and DuBois. All of these fishing spots have tackle gear. Contact us at ccrta@visitclearfieldcounty.org or visit www.visitclearfieldcouty.org for special fishing events.